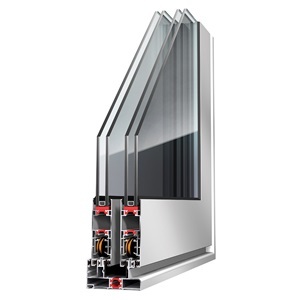 Albio 227 is a thermal break sliding system, suitable for replacing old sliding windows. The triple frame (glass – mosquito net – shutter) is only 95mm wide and is suitable to be installed in narrow wall openings. The sash and frame profiles come with 10mm and 18mm polyamide bars. With sash width 31mm and shutter sash width 28mm, Albio 227 provides the possibility of constructing all the typologies of sliding windows.